Adelaide Duo 669 – Sophisticated contemporary pop/rock music duo. Playing specially chosen hits & memories spanning the past 5 decades. Adelaide Duo 669 Duo have a long proud history of live performance in Adelaide & country South Australia dating from 1991 until the present. We have entertained in most of Adelaide’s finest & most popular venues, including The Adelaide Casino, The Hilton International, The Hyatt Regency, Stamford Plaza & Stamford Grand, Ayres House, Adelaide Festival Centre, Rio’s Nightclub & The Adelaide Zoo. 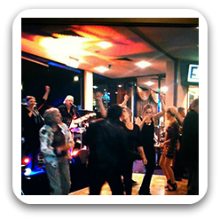 We have played in the greater majority of fine hotels & pubs in Adelaide, and we have also performed throughout the Barossa Valley & the Southern Vales. We specialize in playing the right music at the right time at the right volume for both the patrons & the venue operators. It’s always our desire that everybody involved in a function, whether it be a party, a wedding or a work seminar, enjoys themselves & ends their night out with a smile. We understand the needs of staff in being able to communicate with their guests in order to fulfill their needs efficiently & we strive to be as accommodating as possible with staff & guests alike. Can perform as a: Duo and are available to perform in Adelaide and Surrounding Areas. Adelaide Duo 669 ended up being just what I needed to help me celebrate my birthday. The were professional, yet friendly, accomodating and of course sounded great. So many people told me on the night and later, that they enjoyed the music. I would easily book them again. I was extremely pleased with Adelaide Duo 669 who performed at our conference welcome function in the Adelaide Oval. They sounded fantastic, friendly and very professional. I would highly recommend them for any event as I received a lot of high praise from my delegates. This Duo played at our wedding on the 24/1/2015. They were brilliant. The 2 piece band was exactly right for our smallish (60 people)venue, the right mix of music and special requests. I am sure larger weddings would be equally good. The demo video does not do justice to the quality of vocals and sound that they produced. The volume was just right and the Lady sings beautifully well and he did some great guitar work. They made our reception special and were very friendly and fitted in well. We were so lucky that we chose them. I booked Duo 669 for a 60th birthday party and found them to be excellent. They played in a residential house and knew the correct volume for the premises and were completely friendly, engaged and professional. Their equipment and performance was first class and a major plus is that they have digital backing to accompany them, thus making for a much fuller sound. I would have no hesitation engaging them in future and highly recommend them for any occasion. I agree that the video does not do justice to their performance. Just like to say a big thank you for making our Christmas event fun and entertaining. This Duo knows how to keep the mood going, with a great repertoire of music to suit any event. I have no hesitation in recommending their services to anyone looking to make a good event, a great event. Perfect for a Christmas function – totally aware of the needs of the group and when to play what music. Highly recommended. Thank you for a lovely evening of music! You were the cherry on top of our Christmas party, and greatly appreciate the last minute booking. I would highly recommend this duo for any function – they play to suit the time of the evening ie. during food service, or after for dancing, and they have a great selection of songs.